Yarragon is a township on the Princes Highway, west Gippsland, 112 km east of Melbourne. Lying on the flat plain of the Moe River, the district was known as Little Moe. During the late 1860s and 1870s the country south of Yarragon was selected, extending into the steep Strzelecki Ranges. The construction of the railway from Melbourne into Gippsland further encouraged settlement. The railway station, opened in 1878, was named Waterloo after the British military battle. However, the existence of another town of that name caused confusion with mail. 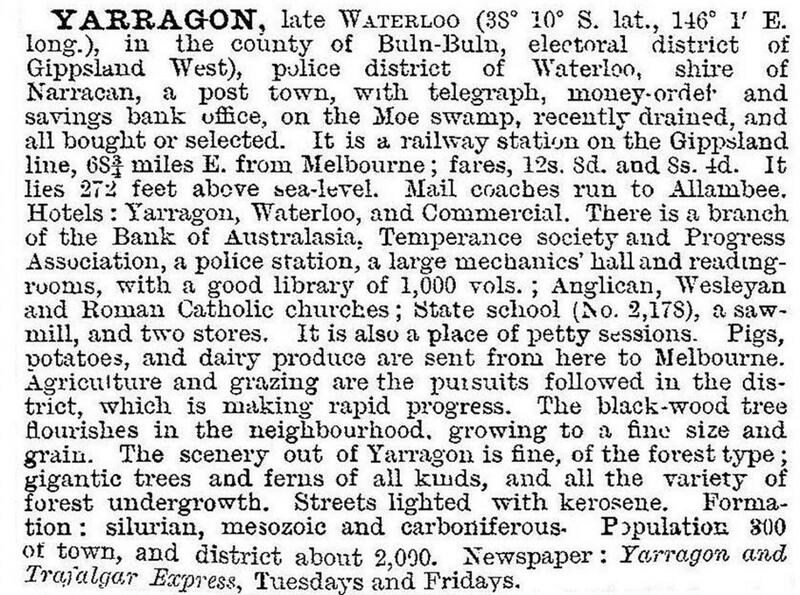 In 1883, the town was renamed Yarragon after the adjoining parish. According to Bunce's Language of the Aborigines of the Colony of Victoria (1859), Yarragondock is an Aboriginal word meaning mustachoes, which may relate playfully to the name Little Moe. A busy township was soon established, with stores and several hotels. A mechanics’ institute hall was built in 1879 and a school operated from the same year. The streets were named after Governors of Victoria and local pioneers. By 1881 there were 311 inhabitants in the town, and another 560 people in the surrounding district. From the 1880s a number of sawmills began operations, clearing settlers’ land. Paling splitters also worked in the forest. Several tramways were constructed to transport the timber and farm produce over the marshy land to the railway station. Two brickworks also built tramways to the rail line. Brown coal was discovered near Yarragon in 1888. Briquettes were successfully made from the coal but the deposits were not extensively developed. Yarragon had been the leading township in Narracan shire, but after 1900 was overtaken by nearby Trafalgar. Dairying became the most important industry in the area. From 1892, several creameries in the district supplied the butter factory at Trafalgar. From 1901, there was a butter factory in Yarragon. The Yarragon Dairy Company was formed in 1935 and in 1954 it was taken over by a large company and in later years manufactured yoghurt and cottage cheese. Casein has also been produced at Yarragon. Yarragon has a post office, railway station, hall, school (141 pupils, 2014), churches, hotel, stores, garage and sporting facilities. As well as serving the farming community, the township caters to tourists passing through the town on the Princes Highway. New shops blend in with the old style village atmosphere. Antiques, arts, crafts and souvenirs are on sale, as well as specialty local produce. The town centre received a tourism facelift in 2003. The Yarragon Community Plan 2008-13 was released in 2008. Priorities included improved traffic control measures, the development of multi-purpose sporting facilities and maintaining its village atmosphere, among other issues. Residents protested in 2013 when test drilling for coal and coal seam gas was conducted close to the town centre. The rural district of Yarragon South rises from the Moe plain to the Strzelecki foothills. Its census population in 2011 was 262.